The WATERfactor wireless node has been specifically designed to exploit the fact that in medium and high density housing units multiple touch pads are located in close proximity to each other. Most AMR / AMI systems require a single wireless node for each touch pad. 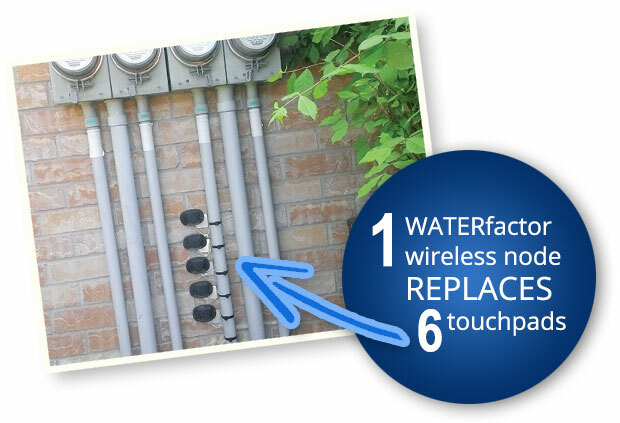 Each WATERfactor node can service up to 6 water meters, making the WATERfactor system significantly cheaper to implement in medium and high density housing complexes, where touch pads are in very close proximity. In some municipalities, this encompasses 20% or more of the total installed meter base.